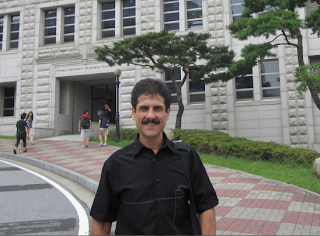 In September last year (2012) I went to South Korea to speak about nonlinear data analysis with WarpPLS (), initially for business and engineering faculty and students at Korea University in Seoul, and then as a keynote speaker at the HumanCom 2012 Conference () in Gwangju. Since Seoul is in the north part of the country, and Gwangju in the south, I had the opportunity to see quite a lot of the land and the people in this beautiful country. 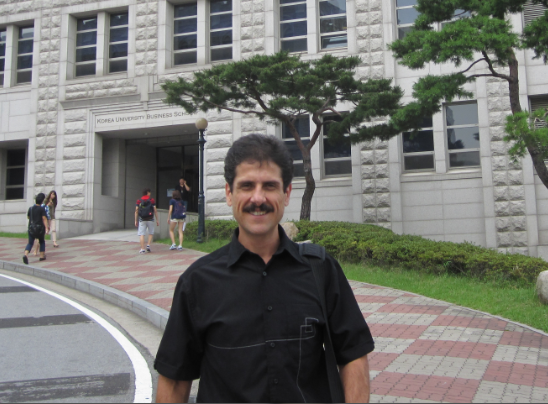 Korea University is one of the most prestigious universities in South Korea. In the fields of business and engineering, it is arguably the most prestigious. It also has a solid international reputation, attracting a large number of highly qualified foreign students. I wanted to take this opportunity and try to understand why obesity prevalence is so low in South Korea, which is a common characteristic among Southeast Asian countries, even though the caloric intake of South Koreans seems to be relatively high. Foods that are rich in carbohydrates, such as rice, are also high-calorie foods. At 4 calories per gram, carbohydrates are not as calorie-dense as fats (9 calories per gram), but they sure add up and can make one obese. Based on my observations, explanations for the leanness that are too obvious or that focus on a particular dietary item (e.g., kimchi, green tea etc.) tend to miss the point. Let us take for example a typical South Korean meal, like the one depicted in the photos below, which we had at a restaurant in Seoul. 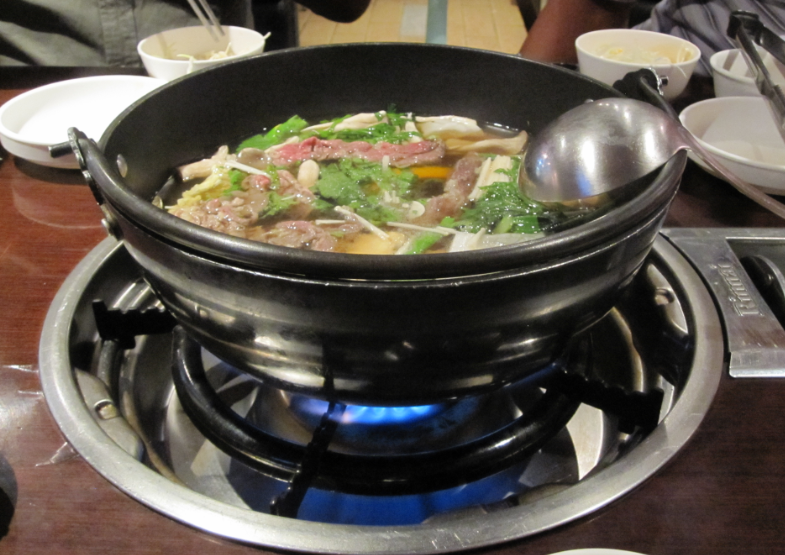 If you are a foreigner, this type of meal would be difficult to have without a local accompanying you, because it is not easy to make yourself understood in a traditional restaurant in South Korea speaking anything other than Korean. 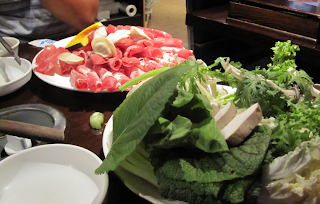 The meal started with thin-sliced meat (with some fat, but not much) and vegetables, with the obligatory side dishes, notably kimchi (). This part of the meal was low in calories and high in nutrients. Then we had two high-calorie low-nutrient items: noodles and rice. The rice was used in the end to soak up the broth left in the pot, so it ended adding to the nutrition value of the meal. Because we started the meal with the low-calorie high-nutrient items, the meat and vegetables, our consumption of noodles and rice was not as high as if we had started the meal with those items. In a meal like this, a good chunk of calories would come from the carbohydrate-rich items. Still, it seems to me that we ingested plenty of calories, enough to make one fat over the long run, eating these types of meals regularly. A side note. As I said here before, the caloric value of protein is less than the commonly listed 4 calories per gram, essentially because protein is a multi-purpose macronutrient. In our meal, the way in which at least one of the carbohydrate-rich items was prepared possibly decreased its digestible carbohydrate content, and thus its calorie content, in a significant way. I am referring to the rice, which had been boiled, cooled and stored, way before it was re-heated and served. This likely turned some of its starch content into resistant starch (). Resistant starch is essentially treated by our digestive system as fiber. Another factor to consider is the reduction in the glycemic load (not to be confused with glycemic index) of the rice. As I noted, the rice was used to soak up the broth from the pot. This soaking up process significantly reduces the rice’s glycemic load, because of a unique property of rice. It has an amazing capacity of absorbing liquid and swelling in the process. This was one of several traditional Korean meals I had, and all of them followed a similar pattern in terms of the order in which the food items were consumed, and the way in which the carbohydrate-rich items were prepared. The order in which you eat foods affects your calorie intake because if you eat high nutrient-to-calorie ratio foods before, and leave the low nutrient-to-calorie ones for later, my experience is that you will eat less of the latter. Another possible hidden reason for the low rate of obesity in South Korea is what seems to be a cultural resistance to industrialized foods, particularly among older generations; a sort of protective cultural inertia, if you will. Those foods are slowly being adopted – my visit left me with that impression – by not as quickly as in other countries. And there is overwhelming evidence that consumption of highly industrialized foods, especially those rich in refined carbohydrates and sugars, is a major cause obesity and a host of other problems. Cultural resistance to, or cultural inertia against the adoption of, highly industrialized foods among pregnant mothers limits one’s exposure to those foods at a particularly critical time in one’s life – the 9-month gestation period in the mother’s womb. This could have a major impact on a person’s propensity to become obese or have other metabolic derangements later on in life. Some refer to this phenomenon as a classic example of modern epigenetics, whereby acquired traits appear to induce innate traits across generations. Another reason I was excited about this trip to South Korea was my interest in table tennis. I wanted to know more about their table tennis “culture”, and how it was influenced by their general culture. China dominates modern table tennis, with such prodigies as Ma Lin, Ma Long, Wang Hao, Wang Liqin, and Zhang Jike. South Korea is not far behind; two of my all-time favorite South Korean players are Kim Taek-Soo and former Olympic champion Ryu Seung-Min. Another side note. The best table tennis player of all time is arguably Jan-Ove Waldner (), from Sweden. I talked about him in my book on compensatory adaptation (). Waldner has been one of the few players outside China to be able to consistently beat the best Chinese players at times when they were at the top of the games, including Ma Lin (). But, as I soon learned, as far as sports are concerned, it is not table tennis that most South Koreans are interested in these days. It is soccer. A nice surprise during this trip was a tour in Gwangju in which we visited a studio that converted standard movies to stereoscopic three-dimensional ones (photo below). These folks were getting a lot of business, particularly from the USA, in a market that is very competitive. Let’s get back to the health angle of the post. So there you have it, two possible “hidden” reasons for the low prevalence of obesity in South Korea, and maybe in other Southeast Asian countries. One is the way in which foods are prepared and consumed, and the other is cultural inertia. These are not very widely discussed, but future research may change that. I strongly believe that lifestyle, nutrition and exercise habits that are compatible with our evolutionary past are the key to optimal health. On the other hand, I do not believe that closely mimicking life in the Paleolithic is optimal for health, or even viable. I am a researcher, software developer, consultant, and college professor. Two of my main areas of research are nonlinear variance-based structural equation modeling, and evolutionary biology as it applies to the study of human-technology interaction. My degrees are in engineering (B.E.E. ), computer science (M.S. ), and business (Ph.D.). I am interested in the application of science, statistics, and technology to the understanding of human health and behavior. I blog about evolution, health, statistics, and technology. My personal web site contains links to my contact information and freely available articles related to the topics of my blogs: nedkock.com. The contents of this blog may be used with proper attribution. This blog makes limited use of copyrighted material (including tables and figures) for commentary, always with proper attribution and in ways that comply with fair use law. Ned Kock gratefully acknowledges that he regularly consults with the most interesting man in the world, especially in connection with complex scientific matters. Subscribe to my podcast on Odiogo.